Bring new confidence, reliability and safety on-line with TheraView®, the cost effective, low-dose, high resolution IGRT digital portal imaging and workstation software solution. Acceletronics is North America's full service and sales dealer for Cablon Medical's latest TheraView Technology IGRT solutions. The TheraView TargetCheck® IGRT workstation, which connects to your existing OEM portal imaging system, is delivered web-enabled to allow remote access for review and has image management network options available that bring the full functionality of TargetCheck®, TheraView's powerful beam alignment verification software, to remote workstations thru-out the department. 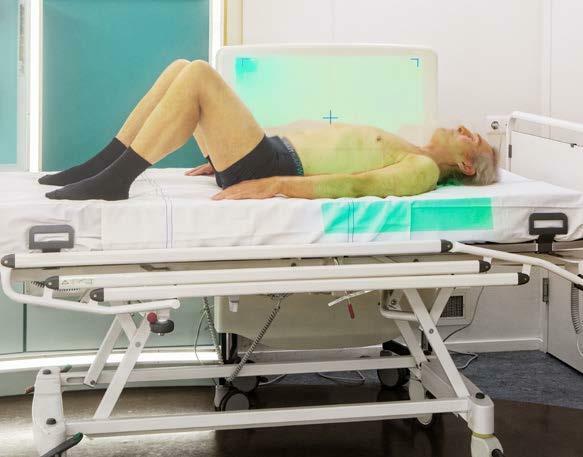 The TheraView TBI (Total Body Irradiation) Image Guided RadioTherapy System can help you significantly improve TBI treatment procedures and outcomes. This flexible, mobile stand-alone imager is part of the integrated TheraView imaging product suite and the only commercially available TBI product of its kind today. Faster results, fewer errors. Instead of simply producing a single image, our solution relies on Intrafraction Monitoring in the form of live video capture to provide high quality megavoltage (MV) images. Video captures can be stopped and restarted to accomodate for changes in the patient's position - so there's no risk of needing to repeat the entire patient setup procedure. This will deliver significantly greater efficiency, faster results and improved treatment quality. The TheraView Couch Setup Assist (TCSA), is an optional hardware/software solution that enables a faster, more accurate positioning of your patient. With TCSA, you can enhance patient care by reducing time spent on the treatment table and the number of trips in and out of the room by the Therapist. TCSA helps position the patient quickly with precision, reducing setup misalignments during patient setup. TCSA integrates with most all treatment couches and all movements are retraceable from the main application. For the department that needs an EPID installed on their existing Linac, the TheraView EPID for IGRT uses high reliability, less costly, radiation hardened, cooled C3D digital X-Ray camera technology for excellent, reliable and stable image quality, with a fiber-optic digital image transmission path to the workstation providing a virtually noise free image. TheraView mounts on any non-beam-stopper linear accelerator and provides superb real-time portal imaging. TheraView is DICOM-RT compatible with all popular image management systems and has motorized digitally controlled movements for accurate and easy set-up, use and stowage. Continual development by the experts at TheraView consistently deliver advanced timely solutions with changing treatment protocols. With the Theraview TargetCheck® IGRT workstation, TBI Image Guided RadioTherapy System or Theraview EPID, manufactured by Cablon Medical (www.theraview.com) you can deliver the current and future technology treatments with accuracy, verification and safety. Please contact us to discuss your MV imaging needs and schedule an online demonstration, we can be reached via email at info@acceletronics.com or call us at 800-543-5144. Visit us at the upcoming 61st Annual AAPM Meeting!